According to the approved work permit on file with the city (and in the DOB's ALL-CAP STYLE: "FILING FOR RENOVATIONS TO EXISTING STARBUCKS STORE. DUCT WORK, SPRINKLER HEADS, PLUMBING FIXTURES, AND RELATED GENERAL CONSTRUCTION." The estimated cost of this work is $985,000, per the DOB. Apparently this location — a popular spot outside the downtown 6 for its restrooms — was in need of an upgrade, at least according to some of the one-star reviews on Yelp. This Starbucks is always full and the tables and chairs are always taken and theirs always a line to use the bathroom although that is next to the subway station entrance and across from a department store, this location needs lots of improvements and make the place more cozy for people. First, it's desperately in need of a renovation: 1) All the tables are scratched and worn. The chairs are the same, plus most of them are ready to fall apart. 2) The roof leaks when it rains. 3) The bathrooms look like they run a cockfighting ring out of them. This outpost opened in the spring of 1995 (RIP Riviera Cafe!) 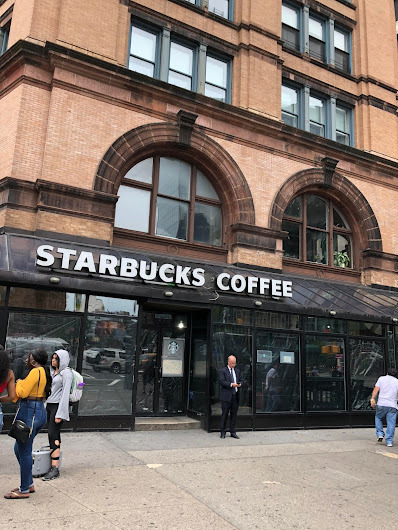 As The New York Times noted then, this 5,000-square-foot, 80-seat Starbuck's was "the chain's largest outlet in Manhattan." 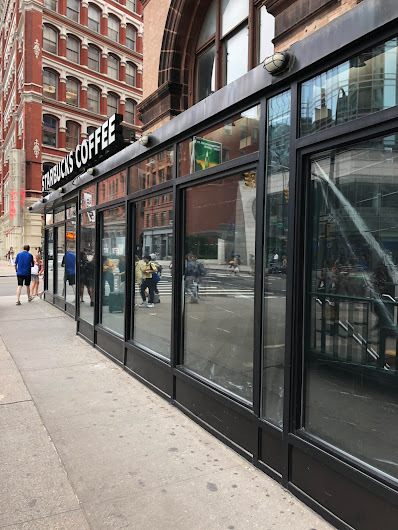 The Astor Place Starbuck's has floor-to-ceiling windows and a vaulted ceiling. "We've been looking at opening stores that are a larger format, using the architecture of the site to its fullest potential," said Kat Spellman, a company spokeswoman. It is the 11th Starbuck's Coffee in Manhattan; several more are planned in the next year. 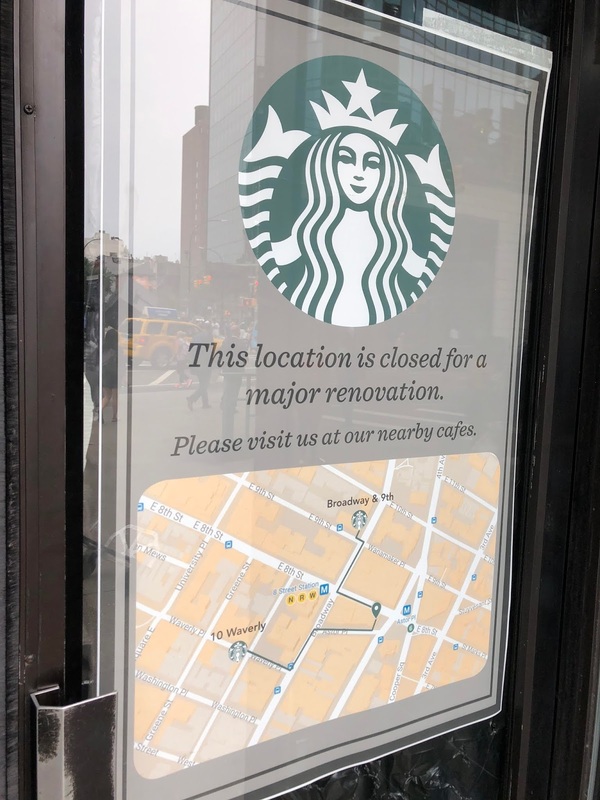 Today, there are 317 Starbucks in Manhattan, according to the Center for an Urban Future. 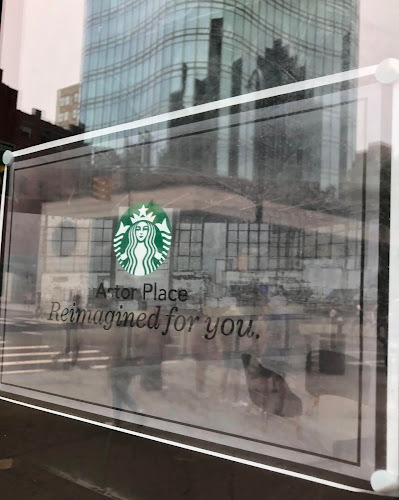 The tipster who passed along this temp closure news noted that the Astor Place Starbucks was expected to reopen on Sept. 6. Those pics really don't show much, but you can still tell that those few customers are quietly freaking the F out. My favorite Starbucks (at Astor Place). Wow, hard to believe it's been there for 23 years already. I'm old! Remember the diner that was there before? I loved that place. For what it's worth, the staff at this Starbucks is probably as efficient and friendly as you are likely to find in Manhattan. They move quickly and are pleasant. It totally needed a refresh though. I loved the Rivera. I love the Starbucks. I've been going there since it opened. And there was nothing wrong with the place. Old is not bad. Worn down is not bad. Scratches on the tables in not... oh, well. And the bathrooms were a lot cleaner than most public bathrooms. The Yelp reviews are so pathetic. And so is ownership. Their market is middle class. Middle class customers think the coffee and food tastes better if the place is brand new and the tables don't have scratches. WHAT A WORLD. Go back to Kansas. New York feels like New York when a restaurant feels like it's been used by generations ... generations... Hah, imagine waxing poetic about a Starbucks. Boy-o-boy. Am I screwed up or what?! Long before Starbucks, and before the Riviera diner, this was a place called Gourmet Treats, whose nickname was Gourmet Threats because the food was often quite bad. You can see it in the background in the 1974 movie The Taking of Pelham, 123, when the police car carrying the ransom money up to the 28th Street 6 train station flips over on the triangle just north of The Cube. They built a fake newsstand there, and the cop car smashes right into it. What’s hilarious about the scene is there is a crowd of a hundred people standing right in front of Gourmet Treats who are obviously penned in there watching the movie being made. It's the only Starbucks I ever had in my coffee place rotation. But that was back in the 90s. At that time it was relatively low key, and a great place to people watch out the windows. I much miss Pasqua Coffee across the way that those Starbuckian Dicks bought out-of-business.